Another great product at even better i-sells prices. 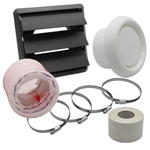 These are great products available at even better i-sells.co.uk prices! 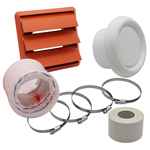 Can be used with either rigid or flexible ducting. 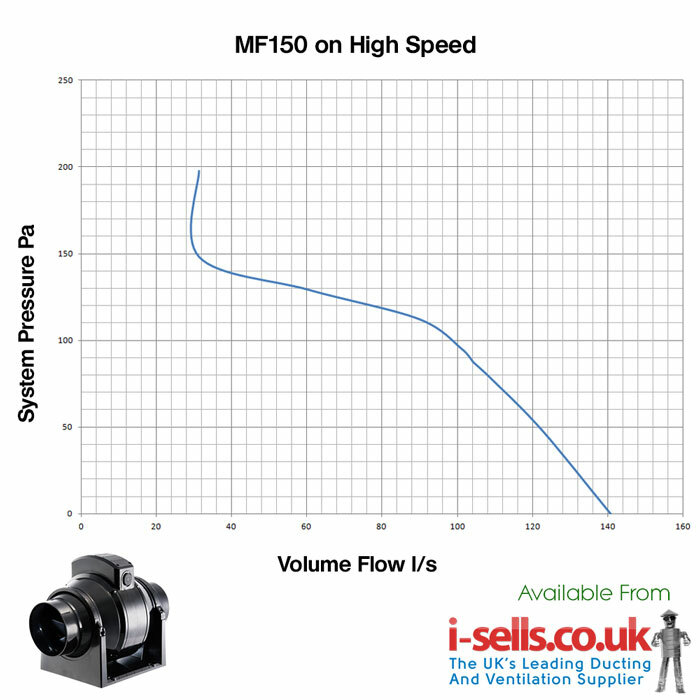 MF100T extractor fan has an adjustable timer of up to 20 minutes. Suitable to be fitted in loft or ceiling. 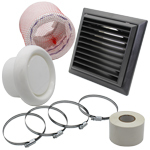 Perfect for bathrooms, kitchens, indoor grow room or other rooms where that need a constant extraction of air. 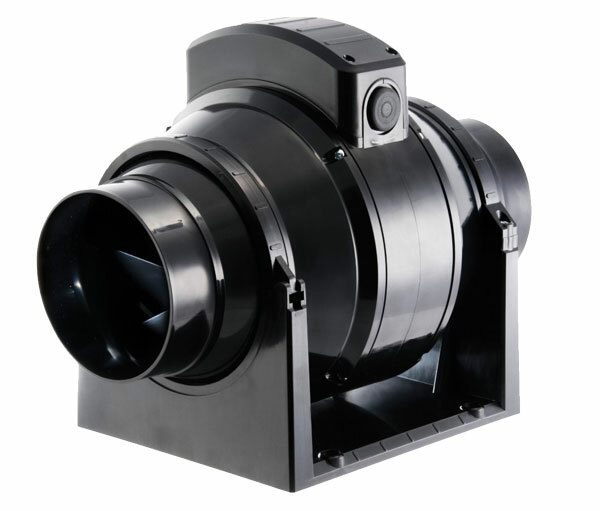 The Manrose MF100T specially designed fan assembly allows easy installation and maintenance. 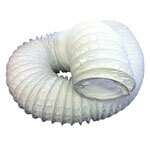 The inline duct is easily installed or removed for maintenance from rigid or flexible ducting. It was easy to install and connect to the ducting. The flow rate at the high speed is good. Connecting two cables (one for power and the other for switching) into the terminal chamber was difficult. The fan is excellent quality and the performance is better than expected. Excellent looking fan does the job very well. I have 4 properties. Since installing these fan, I am happy. Less noise and none have gone faulty over last three years. Top quality item with super fast delivery, excellent price, screwfix does not even stock the item. i-sells I recommend for a no nonsense approach to quality service. The fan is very good quality and the performance is better than expected. I have set it at the lowest speed and can still hear the flow of air through the extract grill. The fan itself is in the loft and cannot be heard. The sound level is not obtrusive and lower than a standard axial extract fan, but it was my goal to have the fan run as quietly as possible. I am still looking into ways of reducing the level of sound. The fan is probably over specified for the small size of the shower room and I suggest carefully assessing the required performance for the size of room. Good item, clears condensation and damp, recommend heat version + 4 way switch. Super quiet, easy to fit, great extraction. Great product.No more steamed up mirrors.Would recommend. As expected it replaced the same product. Brilliant quality product that fits the bill. Ideal for ANY bathroom extraction system. Great price for this fan. Looks good quality. Awesome fan. Very powerful, after a shower or bath the room is virtually bone dry. No misted mirror, no condensation running down the window (that's a first in 27 years). Easy to fit due to the fact the motor can be removed from it's cradle. Slightly louder than my old one (it is 3 times more powerful) but not noisy. The price was the cheapest I could find by a long way for the same fan. Wish I had updated my bathroom fan years ago. Very happy. Looks good. Arrived on time with everything else and I'm sure it'll do it's job just fine when it's installed. This fan far exceeds my expectations, easily installed and the shower room is now clear of condensation. Manrose is top brand. And this model is excellent. I-sells, is excellent. Price is very good. I will be ordering 2 more of these for my other property. Excellent delivery service. The fan is a great product more air flow extracted from my shower room with no no condensation on the walls and mirrors, the fan draws away the the steam within just a couple of minutes leave the room dry and setting my timer at 15 minutes the room doesn't smell damp anymore. The only noise I can hear is the air suction. Cracking fan- great performance with minimal noise. This was the second of these I've installed in the house after being so impressed with the first! Great extractor some reviews said it was noisy but I don't think so the only noise is the sound of air being drawn into the vent ? Fitted inlet above shower even after a long hot shower there is not a trace of steam or condensation in the room, before my WC cistern would be dripping water onto the floor & the mirror would be steamed up but now there is none of that & everything is dry ! So much power that there is a draft under the door as air rushes into the room from the hallway to replace the damp air extracted. Wonderful best thing I ever did to remedy the problem. I ordered the fan at 15.00 on Thursday, paid standard postage and it arrived 13.00 on Friday, excellent service. I have installed the fan and it is pretty quiet, I don't how reliable it is yet as it's brand new. The fan appears well made. It was easy to fit and is quiet running. Extraction from the bathroom is greatly improved over the standard small diameter fan fitted originally. I am very pleased with the purchase. No problem with I-sells delivery and customer service. Had a problem with the fan which had to be returned to Manrose, replaced in less than 24 hrs. replacement fan works fine. Well done I-sells and manrose. Excellent fan; in use for more than a year now. Mounted it on a board which I fitted with rubber "feet" and it's silent!! Arrived in advance of schedule and was easy to install. Much cheaper than any where else. Have purchased other products since from this supplier. Will continue to use in future. Speedy delivery. Excellent customer service. Product very easy to install and effective. Much better quality than I had expected for the price. Clear instructions and easy to install. The only reason it doesn't have 5 stars is because I cant comment on reliability - although no reason to doubt it. Just the job! Good price and high speed delivery too! Came on time and looks a good product - seems like a strong casing. Still to try it out but have high hopes. Great customer service. Excellent product and Excellent service. Many Thanks. Impressed with service and delivery, instructions clear. unfortunately on power-up the fan started before light turned on. Removed from loft and powered up on bench and same issue. What is the procedure for having the item replaced? Thanks in advance Roger ps. rest of parts fitted ok. Yes this product did meet my expectations. Good service and customer follow up to see if I'd like any further help. Very good product. Quite and performs well. Not yet fitted but appears to be just what I wanted. Nothing more to say than - we never use any other In-Line fan ! Fantastic quality and excellent value for money from i-sells ! Really does the job - moves 245 cu mtr / hour which is 6" fan territory! Installed dozens of these. Newly fitted, not yet tested but equipment as described, delivered really promptly and great value for money. 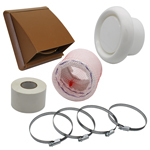 Have bought items from you before and had no problems, will definitely buy again. Many Thanks. Very good product. Installation and wiring very straight forward. I particularly liked the fact the main body of the fan easily detached from the cradle, hence making fixing easy. The 2 connector to which the ducting attaches just lift out which makes fixing flexible ducting very easy. Just fix the ducting and slide the ends back in. Well designed product. Service and communications with this company are superb. Martin Warner on help desk is very professional. Highly recommended. A good fan, quite and powerful. I ordered 3 in total. The last one was faulty, but they sent a new unit, and a free post address for the return. Very efficient. It does the job as described and then some. i-sells' price for this model was the cheapest I could fine. More importantly, the staff were all too willing and able to help and advise me after builders fitted the fan to a less-than-ideal ducting set up. Very impressed all round. 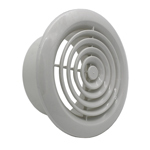 Excellent product - great air flow and super quiet. I purchased this to replace an inferior product (fitted by the builder) that was just too noisy - particularly mounted just over the bedroom (supporting the en-suite ventiation) - I mounted this on a floating board in the roof held between the joists by the loft insulation - the result was it was inaudible virtually even stood right next to it - now I can continue sleeping when the wife gets up to baby sit. 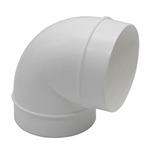 Easy to fit, good capacity air flow through pipe system. Much improved clearance of condensate air, bathroom not steamed up at any stage of showering. Very quiet fan, only noise is slight whistling at ceiling vent, 100% improvement on my old extract fan, definitely worth the money. Excellent service. One of the best in line fans on the market!!! Service and delivery, great. Product, also great. It is silent in operation, until you connect up the ducting then it drowns. That said, its still quieter than any other fan Ive used. Extraction is good. Installation is easy. For the price, why look further. This does the job. FANtastic - great item for the price. Easy to fit and pulls well. This fan performs well. This is my second fan of this model. The first one is mounted under the floor in the downstairs cloakroom and is drawing air from 2 places, one inlet in the shower and one the other end of the room. Timer set for 15 minutes. No moisture and no smells left after that time. The outlet duct is 5 metres long and and changes from 100mm round to 225 flat before exiting through the wall. The 2 inlet ducts are 2.5 metres each. one is 100mm round the other is 225 flat changing to 100mm round. at a T piece. Excellent fan, you cannot ask for more, the fan still works well even with a complicated duct arrangement. Purchased this to add extraction directly in the shower. I needed a device powerful enough to remove steam and quiet / vibration free as it's located under a bedroom floor. it was an easy fit and is doing the job nicely, and quiet. 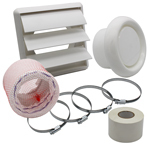 Excellent product and competitively priced. I have installed several of these units and they all perform well. Very happy with items, so much so that I recommended them to a customer and will most likely be purchasing a couple more for them in the next couple of weeks. As described, good price fast delivery. All good. A very good vent fan it stops all the steam and condensation in our shower/bathroom ,i set the run on for 15 minutes which is great. 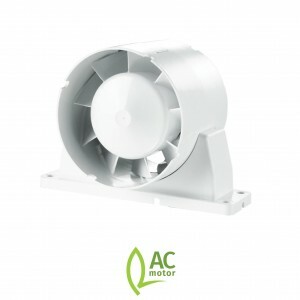 Ordered two of these fans to replace existing lower rated fans in the main bathroom and an ensuite off the main bedroom. Easy to install, with clear instructions for wiring alternate connections for high or low speed running and timer setting. I wired them on high speed and set the timer on for about 25 minutes. Fans are relatively quiet because they are in line and not fitted to ceiling which usually causes a lot more noise. Now in in situ for a week and condensation problems in main bedroom and other parts of house have virtually disappeared even although we have been experiencing extremely low night and day temperatures during this winter spell. JOB DONE! It's too early to give an opinion on reliability, but first impressions are that this is a quality piece of kit. The construction is considerably bigger and more robust than the replaced Screwfix inline fan. Although the peak power consumed is not high the rotor is large and gives lots of airflow - quite sufficient even on the low speed. No fan is going to be silent, but there is no issue here with noise. Very pleased so far - especially as it's much cheaper than the two big brand names who seem to get poor reviews anyway despite their costs. And excellent service from I-sells! Fast delivery! High power fan and surprisingly quiet motor. 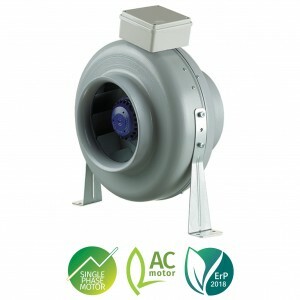 A very well made quality product, easy to fit and significantly more powerful than the little centrifugal fan it replaced. Little noise escapes ‘sideways’ from the system, and the fan is 2 metres from in the bathroom itself, but sound from the inlet pipe even on the slow setting, was startling. Lining the inlet tube with carpet did remove the ‘hiss’ and adding a baffle box did considerably quieten the hollow roar. So a very effective fan, but I wish I had understood what a decibel rating of 20 really meant. Great fan arrived in good time and is working in a shower room with no window and easily keeps it steam free. Great price too! Ordered 2 off these fans, great price, brilliant service, work really well. Could you please send me pressure and volume fan curve? Sure, here are the Low Speed Fan Curve and High Speed Fan Curve pictures. You can now find these pictures in the additional images section as well. Thank you for your question. The fan required for your application will be the MF125t. QS9656. And two dampers will also be required. QS269. Is there a maximum duct length for the extractor? I'm looking to run a 5m duct length in total. How much will it affect the performance? Without knowing the details of your application, the maximum duct run that we would advise would be around 4 metres, with as few bends as possible. Depending on your application you may be okay with a 5 metre run but as the run increases in length and as bends are introduced there will be drops in performance. Are you planning on using rigid round ducting, rigid flat ducting, or flexible hose? The choice of ducting will also affect the efficiency. After switching it on the fan does not start up until after about 45 seconds. Is this normal. My timer is set for around 20 minutes and works fine. Thank you for your question. Please see below Manrose's phone number to speak to there technical department as they can do a diagnostics over the phone. If you still have problems then give me a call on 0208 463 9683. The Tech spec for the MF100 range gives airflow for both high and low speeds but does not appear to give the airflow for the Timer version. 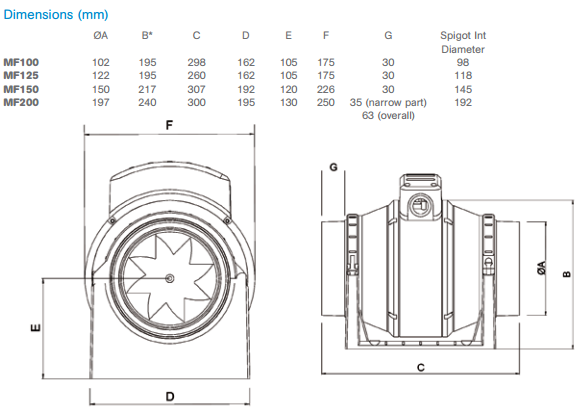 The airflow specifications for the timer model will be exactly the same as the standard fan. 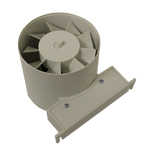 The MF100t Fans are in stock and there are two delivery options. Thank you for your question. If you do not want a timer fan then there is a standard fan in this range which is the MF100s this fan can be controlled if needed by a met controller where as the timer model can not be. Thank you for your question. Please see below Manrose's number for you to give them a call as they will be able to help with your application. I installed a manrose MF100T 2 yrs ago. installed in bathroom zone 1. the flexible duct rises 800mm to get above loft insulation, through the fan and another 3mtr of duct. There is 2 slow 90deg bends and a very slight dip in the middle of the 3mt section. I have just found a large amount of water sitting in the dip. I know the air in the zone 1 has moisture in it, but I am worried about the water. The previous 14 yrs the ducting was used with a basic 4'' ceiling fan. Any advice would be appreciated. Can this fan be used with a slate vent? Thank you for your question. Yes this fan can be used with a slate vent. Can this fan or another model,s speed be changed remotely. I.E. a two position and off rocker sw. I have checked the datasheet for this product and found the paragraph below that appears to answer your question. If I can be of further help please do not hesitate to contact me. It is not possible to use any additional controllers with the Timer variant of the Manrose Mixflo range, but you can use external controllers with the 'Standard' variants of the Mixflo fan range. We have had a similar request using a Kair Controller with a Manrose fan the answer then was yes it was possible however, that is because the 'S' version is a basic model and the RH control just acts as a switch, we do not sell Xpelair models and are unfamiliar with this product but would add a word or warning. Using any non approved control with another manufacturers system will undoubtedly void any guarantee or warranty and may possibly even be dangerous, therefore even if they are compatible, we would advise against it. I live in a ground floor flat , with a bathroom with no outside window, and no loft, so need a very good fan to extract steam /moisture. the ducting in the flat is square shaped and previous fans which have proved ineffective have had to be adapted leaving large unsightly holes in the ceiling which have had to be repaired , do you think the MF100 would be suitable. The equipment you are looking at is designed for ducted installations but there are several questions. For instance, are you sure there is no blockage inside the duct, how long is the run and are there any bends? Where in the duct do you intend locating the unit? Sorry for all the questions but we may be able to help steer you in the direction of a suitable product. would this fan be suitable to pump around 4 vertical meters with ducting up through our chimney? there will be around 3 90 degree bends? also can I use the flexible ducting to solid ducting? 4 Vertical metres - no problem but 3 x 90 degree bends? Assuming these are not in the chimney they must be before so how long is the run and what are you extracting from? Would I put the Intake vent in the shower room or shower cubicle , bath room is 9ft by 3ft inclusive of cubicle. It may seem logical to locate the extract vent above the shower but there is no discernible benefit if it is enclosed and therefore roughly centrally sited to the room is probably preferable. This unit is more than capable of dealing with your bathroom dimensions, though this is an in-line fan usually installed with ducting, is that the same as the fan you currently have? Does the fan come with all fittings i.e. 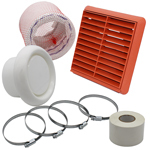 ducting, clips, grilles etc? 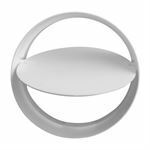 The item is a brand new unit as supplied by the manufacturer, so it does not come with any ducting, hose clips, or grilles. This is because each installation is different - For example, some installations may only require a 1 metre length of rigid ducting, while others require 3 metres of flexible hose. Some customers may prefer a white louvred grille to blend in with their tudor-style cottage, while others want a terracotta gravity grille to blend in with their 'London red' brick wall. 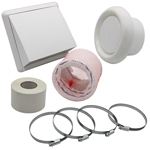 It is therefore quite standard across all manufacturers - not just Manrose - to provide the unit and to allow the customer to choose their best option themself, with the exception of 'shower fan kits' and other pre-packaged kits aimed at the retail market. 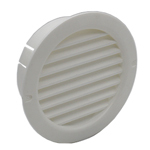 We therefore supply a very large range of plastic and metal ducting to suit all installation types, including multiple different styles of grilles. The most popular choice for the Manrose MF100T or MF100S Mix Flo fan would be our Kair Round System 100 range of fittings. You can take a look at the range by clicking the link above. If you are having any trouble locating a particular item, such as a certain colour or style of grille, please do not hesitate to give our team a call on 020 8463 9696. I have just checked the installation instructions to see if it is a separate part and of there was a part number involved and it appears the impeller is the actual main housing or the fat drum of the machine and therefore the most expensive item. If this is available (there is no part number) and looking at how it comes apart to change over the central section ( I suggest you have a look) I cannot see how this will be worth the time and effort or value for money as if another part became broken in disassembly what happens then? If you still want us to check we will but I don't think it will be much less expensive than a replacement unit. Hi I'm wiring up the MF100 but the propellor inside only turns very slowly (not enough to create any draft). Also when I switch the bathroom light off the extractor keeps running even though this is a non-timer model. Any help greatly appreciated! I am sure they will be able to help. The warranty is 3 years or 30,000 hours from date of purchase. 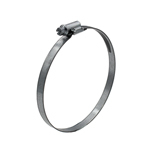 The first year is covered by the vendor and subsequent two years by the manufacturer. The length of the duct run should not be a problem for this product but the type of ducting you are considering using may determine whether there is a possibility of condensation forming in the duct so we would recommend insulated flexible ducting. The horizontal run shouldn't be a problem but we would recommend a condensate trap at the point before the 45 degree bend, therefore if water ran back down the duct it would not get to the fan. An additional recommendation would be to go for the MANMF100S unit instead as there are several control options (constant running, adjustable speed control, humidistat control, PIR sensor etc) that are not compatible with the T version and some of these would help if you felt the ducting could do with a sustained airflow purge to dry out. Hi we have recently had this in line fan installed but steam still gathers on the mirror and window can you advise if we are able to check what speed setting the fan is on and how to adjust if necessary. Thank you for your question. I would advise calling the installer back who installed the fan to check what setting the fan is on also to check if the ducting (if flexible) is pulled taught as this will restrict the airflow. 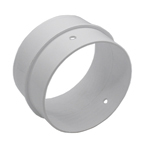 We would suggest that, where possible, you use rigid duct with slight run to falls. The timer version is not compatible with any other controls so we would recommend the 100S version as this can be wired to humidistat (QS5409), variable speed control (QS5406), PIR Sensor (QS5410) or combination humidistat and overrun timer (QS5407). Any of these options can be retro fitted. For the duct run we would recommend ceiling sited diffuser, short connector to 90 degree bend to 1m duct to machine then 3m duct to falls with 90 degree bend (or rectangular conversion) to soffit. What is the range of time that the timer can be set to for this product ?. Thank you for your question. 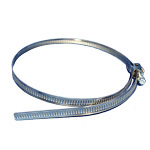 You would require a female sleeve or a piece of pipe to connect the back draft shutter to the fan as the spigot and back draft shutter are both male connectors and will not fit together. Will a 100mm rigid 90 degree bend fit directly onto the outlet / inlet spigots of this fan or does it require some ducting in between? New House, Building Regs advise Trickle vent short fall of 53,000mm2. 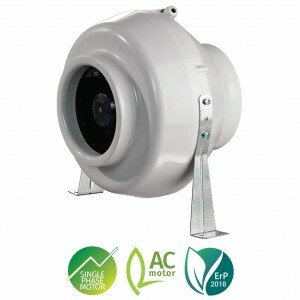 Will the MontroseID 1505 Fan inline deal and comply with this in an open plan area loft mounted situation? We would recommend that you pose this question to building control as they may have objection to powered ventilation over passive, and/or how it is controlled? What is the mid-speed extraction rate? When setting the timer overrun what should govern how long one lets it runs for? The overrun timer setting really is a matter of choice and how susceptible the room is to surface moisture (condensation) and what produces the water vapour so a bathroom without a shower may need less overrun than a bathroom with a shower and a room with a power shower would need a longer overrun for surface water evaporation and dispersal. how do you adjust the timer on a unit that is already fitted? Thank you for your question. TO ADJUST OVER-RUN TIME - TIMER MODELS ONLY. USE A SMALL SCREWDRIVER TO ROTATE THE ADJUSTER. ANTI-CLOCKWISETO REDUCE THE TIMING, CLOCKWISE TO INCREASE THE TIME. 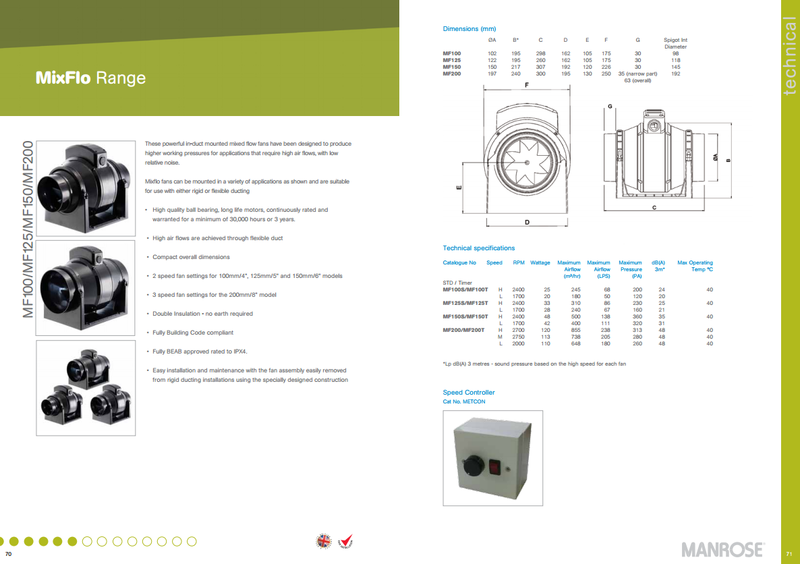 The diagram can be found on the PDF for the fan on our website. can the mf100t be used with rectangular rigid ducts? How far can I have the fan from the extraction point. My sons bedroom is in the loft and his bed over the bathroom. Can I have the extractor fitted at the other corner with ducting running 6 meters to the fan. 6m is the recommended duct length for this system though generally accepted that the unit would be installed at the half way point. If using flexible ducting ensure it is pulled taught and as few bends as possible and there shouldn't be a problem. I want to install one of these in the ceiling over my cooker, which is on an internal wall. It will be vented in the attic to the external wall - about 9 feet. My concern is that the grease, etc., from cooking might have an effect on the fan. Any advice? Yes your concern is well founded, this type of fan should not be installed as a cooker hood substitute. 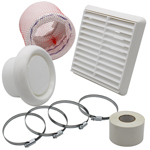 Hoods are fitted with grease filters which go some way to protecting the fans and the ducting, they also have a different impeller (fan blades) so that there is minimal contact with the pollutants passing through. If you are trying to avoid a traditional cooker hood and want the fan in the loft you will still need to install a canopy with grease filters to prevent a fire risk. Hi, The fan I am replacing is switched on with the Bathroom light, can this fan be connected in same way. 1. do we set the speed or does the unit start with speed 1 and then step through speeds 2 & 3 ? 2. Do you have a branch local to DY8 3AF? 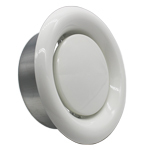 The MF100T is only bathroom light or switch activated it is not compatible with the 1361. 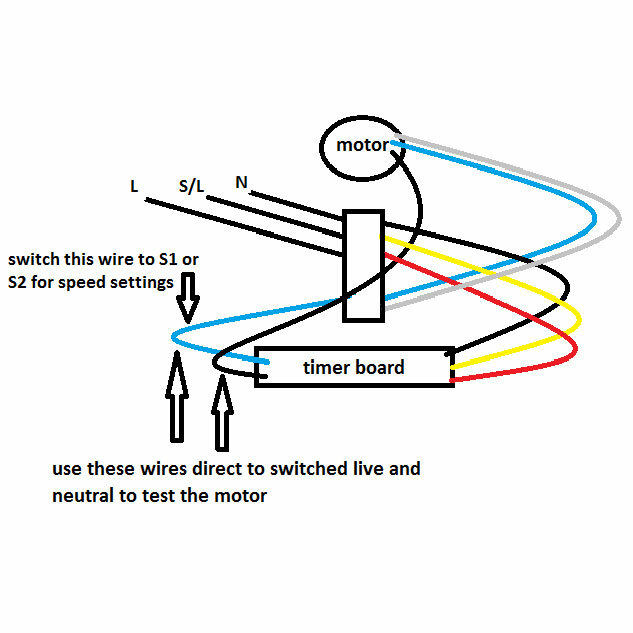 I would be replacing a Vortice in-line fan which is fed by an existing 4-wire cable (two way circuit?) - can I use this fan with the existing wiring? Thank you for your question. 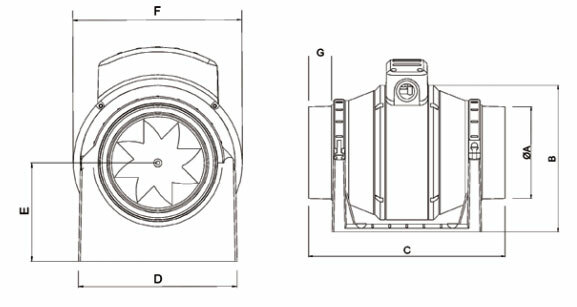 The wiring diagram for this fan can be found on our website in the PDF section for the fan. If you have any problems please let me know and I will send on a separate e-mail.